Northmor’s Marcus Cortez pinned his Mansfield Senior opponent Wednesday and went 2-0 on the night to help his team claim a pair of dual wins. 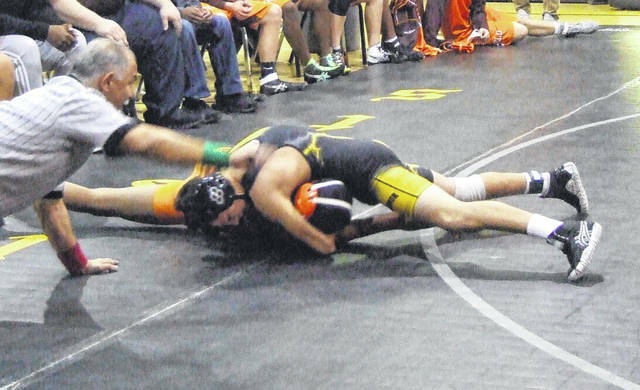 Northmor’s wrestling team started their season with a pair of dual victories when they hosted Mansfield Senior, Upper Sandusky and Crestview on Wednesday for a quad. The Golden Knights took on Mansfield Senior and Upper Sandusky on the night, defeating the Tygers 45-35 and the Rams 44-33. Against Mansfield Senior, Northmor won four matches by first-period pin. At 120 pounds, Marcus Cortez pinned his opponent in a mere 18 seconds. Niko Christo won via pin in one minute at 138 pounds, while Conor Becker won in 29 seconds at 182. Also, 285-pounder Hunter Brookover claimed his pin in 58 seconds. Austin Amens claimed a hard-fought 9-7 overtime decision at 145 pounds. Winning by forfeit were Dale Brocwell (106), Eli Davis (152) and Tony Martinez (160). In the win over Upper Sandusky, the team won five matches by pin. Trenton Ramos (126) finished his match in 1:14, while Gavin Ramos (132) took 39 seconds to dispatch his opponent. Martinez won in 1:15, Becker only took 17 seconds to win and Brookover pinned his opponent in 20 seconds. Christo earned his second win of the day via 16-1 technical fall, while Amens won by 11-4 decision at 152 pounds. Also, Cortez won by forfeit. In the night’s other matches, Crestview beat Upper Sandusky 40-36 and lost to Mansfield Senior by a 51-24 margin.